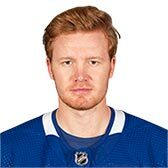 Frederik Andersen is 6' 4 and weighs 230 pounds. He is currently 29.6 years old. Was a full participant in today's practice.